Advanced Mass Flow Systems utilize the specific heat properties of gases to measure true mass flow rate. 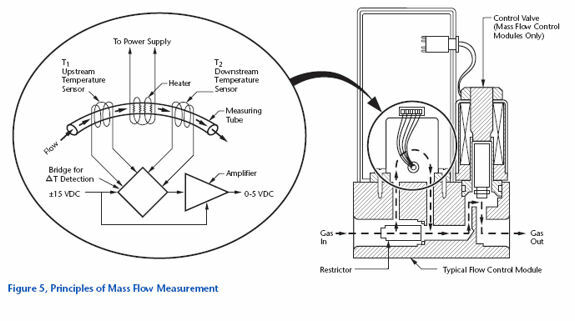 Our Mass Flow Sensors and Control Modules both utilize the measuring principles illustrated in Figure 5. As shown, some of the gas entering the device splits away from the main stream where it flows through a measuring tube before returning to the main stream. Laminar flow principles are incorporated to keep the two streams proportional. The measuring tube is wrapped with a heater coil which uniformly heats the gas stream. In addition, temperature sensors are placed around the tube, one upstream(T1) and one downstream (T2) of the heater coil. The resulting electrical signal is amplified, linearized and fed to the Operator Console as a 0–5 VDC signal which is proportional to flow rate—0 volts with no flow, and 5 volts at maximum flow. Measuring tubes used in our Flow Sensors and Control Modules have an internal diameter of approximately 1/10,000 of an inch. Because of this small size, it is extremely important that gases entering the device are kept clean. Most of the more common noncorrosive gases (such as Nitrogen, Hydrogen or Helium) are relatively clean products. However, piping systems, cylinders and other equipment can contribute rust or other particulate contamination that could foul the device. Therefore, it is highly recommended that all gases be filtered before they enter Flow Sensors and Control Modules. In addition to the measuring principles described, our Mass Flow Control Modules have an electromagnetic control valve at the outlet as shown in Figure 5. When the operator programs a flow rate into the Operator Console it is translated into a command signal (also 0–5 VDC) which is sent to the Control Module. A comparative amplifier in the Control Module compares this command signal against the flow signal and directs the control valve to throttle open or closed until the two signals are in equilibrium. The Operator Consoles act as an AC to DC transformer to provide power to the Flow Sensors and Control Modules. They also convert the electrical flow signal from the Sensors and Control Modules to a digital display of flow rate. And when used with Control Modules, the Operator Console provides a command signal for setting flow rates.